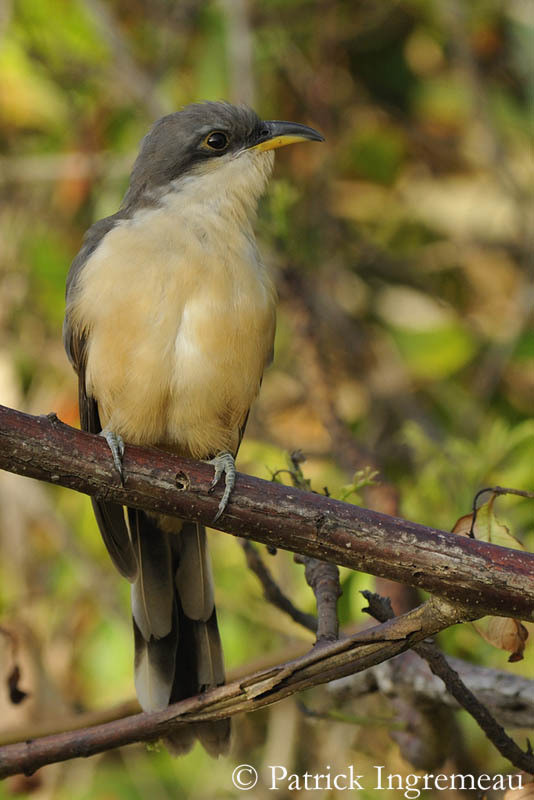 Mangrove Cuckoo is polymorphic with dark and pale morphs. Adult male has grey upperparts, with brownish flight feathers, and graduated blackish tail with white oval tips. In pale morph, underparts are whitish on chin and throat, becoming buff on breast, belly and vent. In dark morph, underparts are cinnamon-chestnut. Upperparts are slightly darker than in pale morph. In both morphs, forehead, crown and nape are grey. We can see broad black eye-line from lores, through eyes and to ear-coverts. Cheeks are whitish in pale morph, and buffy-white in dark morph. Curved bill has black upper mandible and lower is yellow-orange. Eyes are dark brown, with grey, sometimes yellow, narrow, bare eye-ring. Legs and feet are grey. Juvenile has edged rufous wing coverts and flight feathers. Black eye-line and undertail pattern are less contrasting. Mangrove Cuckoo most common call is a low “gawk gawk gawk gawk gauk gauk”. This series of hard, nasal notes accelerates towards the end. We can also hear a single “whit”. 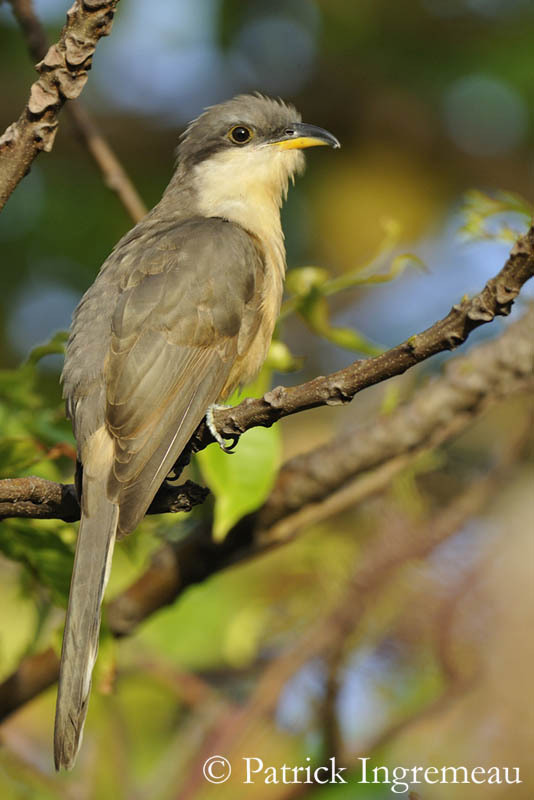 Mangrove Cuckoo lives mainly in mangroves, but it also can be found in estuaries, swamps, thickets near water, dry scrub and loose tropical deciduous forest. It is a coastal bird, living mainly at sea-level, but locally, it can be found up to 1000 metres, and it can breed higher, up to 1300 metres. 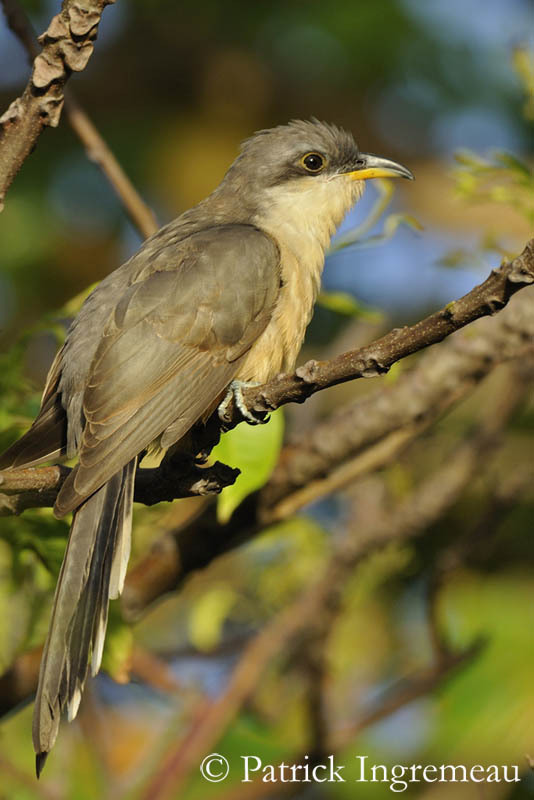 Mangrove Cuckoo is found in the Caribbean, both Mexican coasts, and Atlantic coast of South America south to the estuary of the Amazon River. Mangrove Cuckoo feeds mainly on insects. It hunts from a perch, looking attentively at vegetation. It pursues its prey by hopping, and it also can run. It takes fruits and berries from trees and shrubs, or from the ground. This species is non-migratory, except in Florida where populations move southwards for wintering, and return in March. Birds can disperse, due to hurricanes. Courtship displays are unknown, but the white oval tips of tail feathers probably play an important role, when male spreads and raises its tail. This species is shy and secretive, often hidden among foliage. 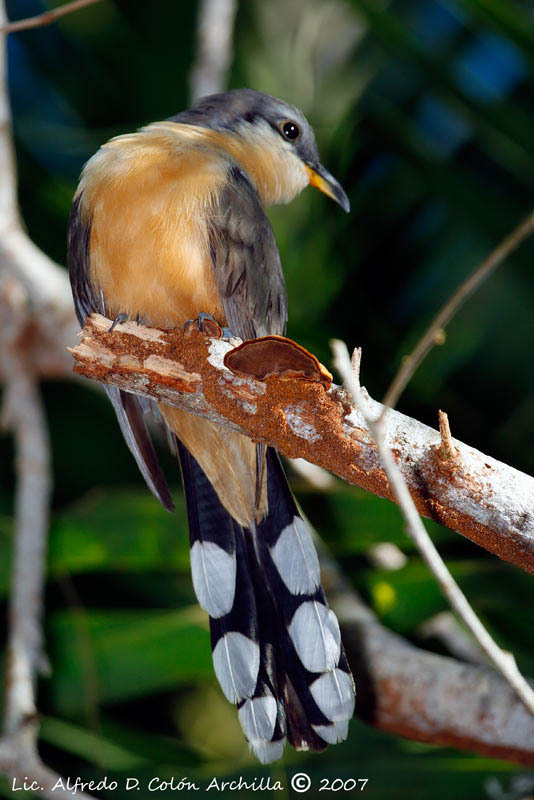 Mangrove Cuckoo glides silently through the forests, sometimes uttering guttural “gaw gaw gaw”. It can also perform rapid direct flight with steady wing beats. Breeding season varies, according to the range. Mangrove Cuckoo is monogamous and mainly solitary nester, but it can sometimes form loose colonies. Female lays 2 pale blue eggs, occasionally three. Incubation lasts about 9 to 11 days, shared by both sexes. Altricial chicks are fed by both parents with insects. Young grow rapidly and can leave the nest very soon, as little as 10 days. It threatened or disturbed, they can climb into the branches around the nest. This species can produce two broods per season. Mangrove Cuckoo builds its nest and rears its young. This species is not brood-parasite. Mangrove Cuckoo feeds mainly on insects, caterpillars (hairy or not) and large insects such as grasshoppers, crickets, mantis, cicadas, bugs, beetles, and also spiders. It also consumes snails, lizards and fruits. 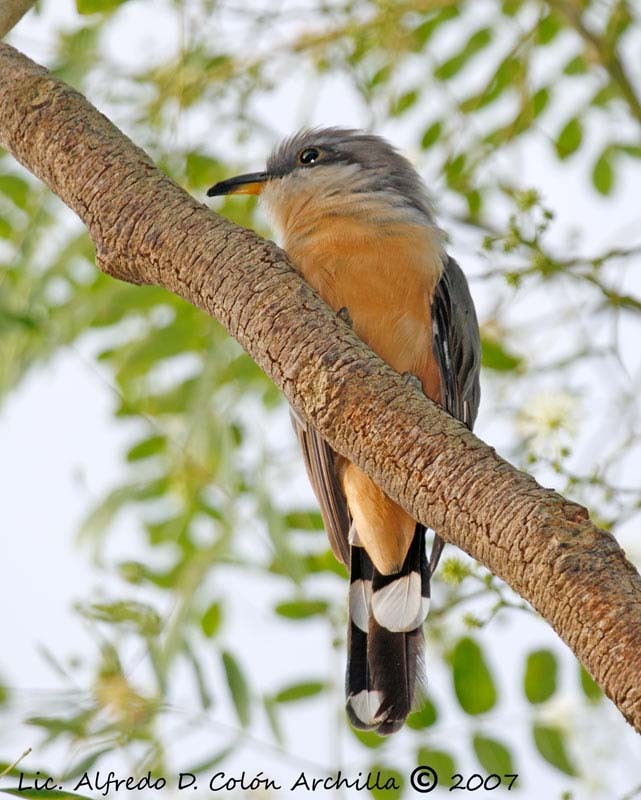 Mangrove Cuckoo hunts by ambush, remaining motionless and peering from its perch. Then, it grabs the insect and returns to its perch. It “cleans” the caterpillar before eating it. It bites off the end of the gut, in order to remove toxic leaf products which are inside. It can also wipe the caterpillar on a branch before to swallow it. It also beats hairy caterpillars against a branch, always for removing gut contents. Hairy caterpillars are eaten with intact hairs. Then, Mangrove Cuckoo regurgitates pellet with indigestible items. Mangrove Cuckoo is uncommon to fairly common throughout the range. In some parts of its habitat, it is threatened by human developments and degradation of mangrove habitat.